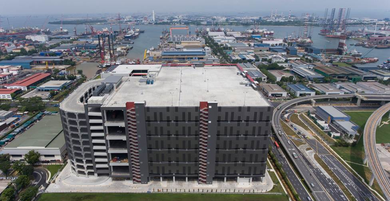 ICD was recently selected by leading logistics company Toll Global Logistics to design and implement a complex integrated security system at their new Singapore logistics center. With ambitious expansion plans in Asia, Toll built this strategic site to serve as both a regional hub and a local distribution centre. Toll sought a cutting-edge, integrated security solution to secure the site, a solution which would meet the demands of their security-sensitive clients and would position Toll at the forefront of high-tech security deployment at logistics sites. After gaining a detailed understanding the security requirements, challenges and risks at the logistics center, as well as Toll's global security standards, ICD was able to design and implemented a complex security solution encompassing video surveillance, access control, alarm, visitor management and intercom systems. The solution, of over 750 devices, protects the site from intrusion, provides full video surveillance and allows Toll to maintain accurate information regarding the number of people and vehicles onsite at any time. As stipulated by the client, the security solution was installed in line with TAPA Class A standards in specific areas. With a world-class, integrated security solution at the site, Toll boasts some of the best security systems and practices in their industry. The overall solution not only ensures the safety and security of employees and stock at Toll City, but is also perceived as a value proposition for Toll’s customers in sensitive market sectors. As Toll expands throughout the region, the Toll City security solution will be held as a model solution which may be replicated at Toll’s future logistics centers in Asia.